Dr. Holzum was born and raised in St. Louis, Missouri where she graduated from the University of Missouri, Kansas City School of Medicine in Kansas City. She completed her residency training at Southern Illinois University School of Medicine in Springfield, Illinois. Dr. Holzum is certified by American Academy of Pediatrics. Being a recent transfer to California, Dr. Holzum is excited to take advantage of the vastly improved climate and the great variety of things to do including exploring the beaches, hiking trails and going to concerts! She is also diligently working on improving her Spanish language skills and invites families to test her fluency during their visit! LaSalle Medical Associates is pleased to welcome Laura Holzum, MD to care for their growing number pediatric patients. A recent transfer from St. Louis, she looks forward to discovering all California has to offer and invites her patients to test her Spanish language fluency on their office visits. LaSalle Medical Associates, Inc, recently celebrated three decades of growth operating four Neighborhood Medical Centers employing more than 120 dedicated healthcare professionals, treating children, adults and seniors in San Bernardino County. LaSalle’s patients are primarily served by Medi-Cal and they also accept Blue Cross, Blue Shield, Molina, Care 1st, Health Net and Inland Empire Health Plan (IEHP). LaSalle’s Neighborhood Medical Centers are at: 17577 Arrow Blvd. in Fontana, 16455 Main Street in Hesperia and1505 West 17th Street and 565 N. Mt. Vernon Avenue in San Bernardino. LaSalle Medical Associates, Inc, is also an Independent Practice Association (IPA) of independently contracted doctors, hospitals and clinics, delivering high quality care to more than 245,000 patients in Fresno, Kings, Los Angeles, Madera, Riverside, San Bernardino and Tulare Counties. LaSalle’s IPA members in the Inland Empire include: LaSalle Medical Associates, Arrowhead Orthopedics, Arther Medical Group, Rancho Medical Group, Rancho Paseo Medical Group, Alessandro Medical Group Banning Medical Group, and San Bernardino Urological Associates. Hospital affiliations include: Rancho Springs Medical Center, Arrowhead Regional Medical Center, Community Hospital of San Bernardino, St. Bernadine Medical Center, Mountains Community Hospital, Redland Community Hospital, Loma Linda University Medical Center, Corona Regional Medical Center, Riverside County Medical Center, Parkview Community Hospital. (San Bernardino, CA) LaSalle Medical Associates and HealthNet have forged an alliance that has brought more than 50,000 new patients to LaSalle’s Independent Practice Association (IPA). for by LaSalle to more than 245,000 patients in the seven California counties it operates. LaSalle Medical Associates has also been caring for more than 28,000 patients in their four award-winning Neighborhood Medical Centers located in San Bernardino County since 1986. “Operating our own clinics for so many years has uniquely positioned us front and center to the multitude of challenges medical practices face every day, and why our IPA has earned its outstanding reputation of providing solutions and results for our IPA clients,” explained Carl Maier, Executive Vice President of Operations. LaSalle Medical Associates, Inc., operates four clinics employing more than 120 dedicated healthcare professionals, treating children, adults, and seniors in San Bernardino County. LaSalle’s patients are primarily served by Medi-Cal and they also accept Blue Cross, Blue Shield, Molina, Care 1st, Health Net and Inland Empire Health Plan (IEHP). LaSalle’s clinics are at 17577 Arrow Blvd. in Fontana, 16455 Main St. in Hesperia and1505 West 17th St. and 565 N. Mt. Vernon Ave. in San Bernardino. LaSalle Medical Associates, Inc., is also an Independent Practice Association (IPA) of independently contracted doctors, hospitals and clinics, delivering high quality care to more than 245,000 patients in Fresno, Kings, Los Angeles, Madera, Riverside, San Bernardino, San Joaquin and Tulare Counties. LaSalle’s IPA members in the Inland Empire include: LaSalle Medical Associates, Arrowhead Orthopedics, Arther Medical Group, Rancho Medical Group, Rancho Paseo Medical Group, Alessandro Medical Group Banning Medical Group, and San Bernardino Urological Associates. Hospital affiliations include: Rancho Springs Medical Center, Arrowhead Regional Medical Center, Community Hospital of San Bernardino, St. Bernadine Medical Center, Mountains Community Hospital, Redland Community Hospital, Loma Linda University Medical Center, Corona Regional Medical Center, Riverside County Medical Center, Parkview Community Hospital. Patient Malaika Jacocks looks on as Dr. Romeo Rodriquez enters important information in LaSalle Medical Associates’ Electronic Medical Records system. (SAN BERNARDINO, California) LaSalle Medical Associates is now providing its patients a more streamlined health care delivery experience by upgrading to, electronic health records All four of its clinics in San Bernardino and its corporate office have recently transformed their method of managing, securing and sharing patient information between its team of dedicated physicians. “Our patients are our priority and by investing in this technology it will allow us to spend more time focusing on their needs rather than managing inefficient paper processes, “said CEO Dr. Albert Arteaga. Sharing information, writing prescriptions and fostering better communications between labs and medical staff are just a few of the ways we can increase the efficiency of care,” said Carl Maier, vice president of operations for LaSalle Medical Associates. Using an Electronic Health Records, doctors can now send prescriptions directly to a pharmacy during an office visit so a prescription arrives at the pharmacy well before a patient does. Doctors can send lab orders to a medical lab, while lab technicians can send results back to the doctor quickly and securely. “It’s all about reducing time spent on administrative tasks so we can focus on caring for our patients,” said Maier. Although these advantages improve patient care, LaSalle Medical Associates had one more crucial reason to make the switch to electronic records this year, Maier said. It was for this compelling reason that LaSalle Medical Associates decided it had to make the switch to electronic records this year, Maier said. Since it required months of preparation, it wasn’t a decision made lightly. For instance, Maier said, doctors were used to starting their day by reviewing a stack of paper medical records for the patients they would see that day. Now, they must look at their email accounts to know which patients they are seeing, and to access these patient records. To help with the conversion, LaSalle Medical Associates worked with Physicians Trust, a southern California company that specializes in helping medical practices convert to electronic medical records. It oversaw a technology upgrade that included far more than converting to electronic records. For more information on LaSalle Medical Associates call 909-890-0407. LaSalle Medical Associates, Inc., operates four clinics employing more than 120 dedicated healthcare professionals, treating children, adults, and seniors in San Bernardino County. LaSalle’s patients are primarily served by Medi-Cal and they also accept Blue Cross, Blue Shield, Molina, Care 1st, Health Net and Inland Empire Health Plan (IEHP). LaSalle’s clinics are at 17577 Arrow Blvd. in Fontana, 16455 Main St. in Hesperia and 1505 West 17th St. and 565 N. Mt. Vernon Ave. in San Bernardino. LaSalle Medical Associates, Inc., is also an Independent Practice Association (IPA) of independently contracted doctors, hospitals and clinics, delivering high quality care to more than 245,000 patients in Fresno, Kings, Los Angeles, Madera, Riverside, San Bernardino, San Joaquin and Tulare Counties. LaSalle’s IPA members in the Inland Empire include: LaSalle Medical Associates, Arrowhead Orthopedics, Arther Medical Group, Rancho Medical Group, Rancho Paseo Medical Group, Alessandro Medical Group Banning Medical Group, and San Bernardino Urological Associates. Hospital affiliations include: Rancho Springs Medical Center, Arrowhead Regional Medical Center, Community Hospital of San Bernardino, St. Bernadine Medical Center, Mountains Community Hospital, Redland Community Hospital, Loma Linda University Medical Center, Corona Regional Medical Center, Riverside County Medical Center, Parkview Community Hospital. 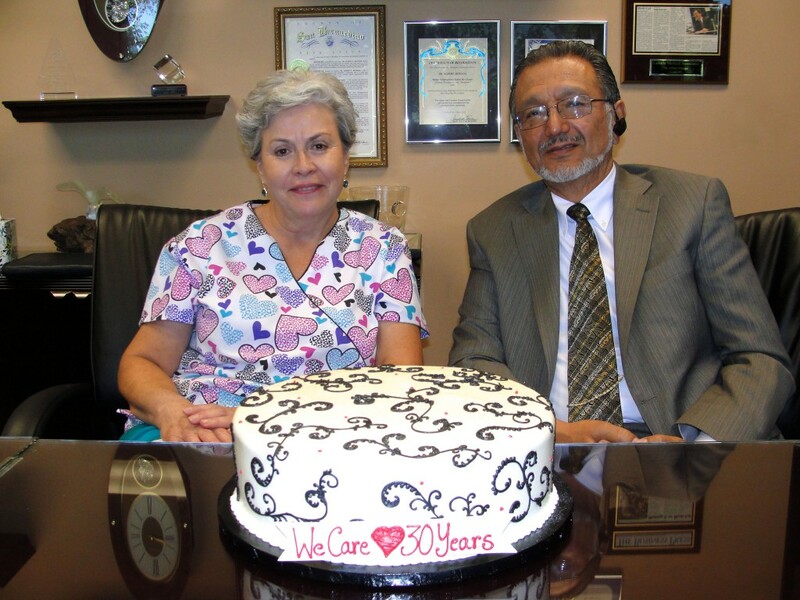 LaSalle Medical Associates, Inc Celebrates 30 years of medical service with the corporate management team. Left to right: Anna Canton, Human Resource Manager; Kristina Hlebo, Finance Assistant,;Carl Meier, executive vice president; Dr. Albert Arteaga CEO; Alexandra Acosta, Director of Finance and Lizette Noriega, Human Resource Assistant. (SAN BERNARDINO, Calif.) In June of 1984, a young doctor and his wife, a nurse, opened a family medical practice called LaSalle Medical Associates in Fontana. Their goal: provide affordable health care, with dignity and respect, to all in the Inland Empire. Three decades later, Dr. Albert and Maria Arteaga have gone far beyond making their goal a reality. They are now recognized as one of the leading health care providers in the Inland Empire, if not all of California. “It has always been our goal to treat as many patients as we could while giving them the best health care possible,” he said. The San Bernardino County Medical Society’s Merlin Hendrickson, M.D. Award for Outstanding Contribution to the Community. 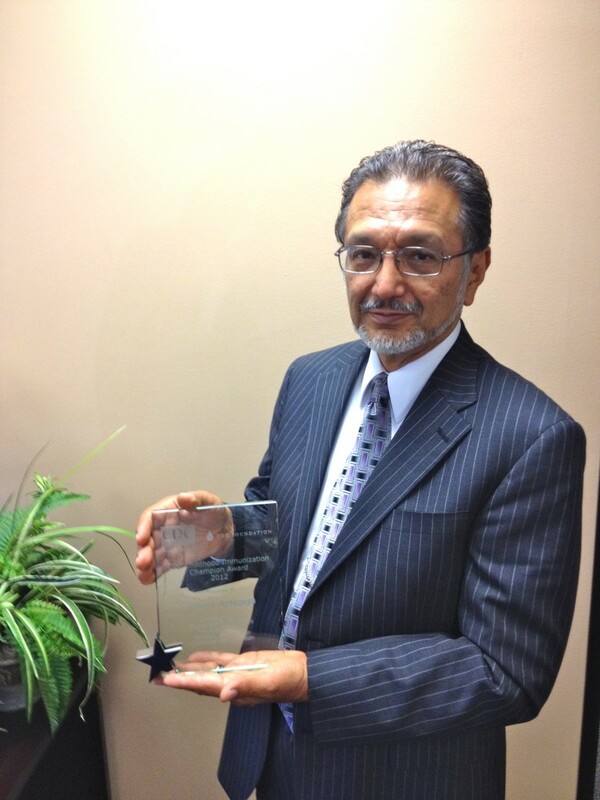 Dr. Arteaga was recognized for his efforts to provide health services to Inland Empire children. 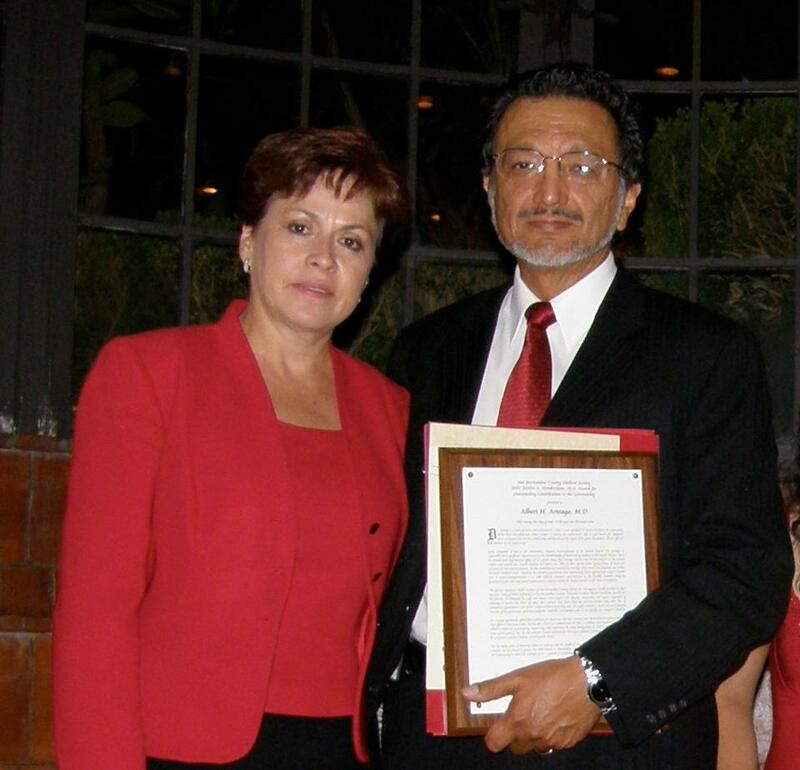 Maria and Dr. Albert Arteaga. The California Medical Association awarded Abert Arteaga the “Ethnic Physician’s Leadership Award,” recognizing his contributions to medical care in the Latino community. The African American Health Initiative as a model provider in a two-year study of Black health care in San Bernardino County. Despite all this success, it hasn’t always been an easy path for the Arteagas. One of the biggest changes in health care took place just this year. In 2014, Covered California part of the federal Affordable Health Care Act – which Dr. Arteaga has long been a champion of – came into being. Dr. Arteaga has always thought that health care is a basic right, and has operated LaSalle Medical Associates as if that were the case. Dr. Arteaga targeted his marketing to Latinos and low-income people who were underserved. Providing high quality medical services to underserved populations were crucial to the success of LaSalle Medical Associates. They later expanded from Fontana to San Bernardino and Hesperia. These communities have many low-income people in need of quality affordable medical services. He also is Latino, so he easily related to his Latino patients in ways they appreciated. They told friends and family about LaSalle Medical Associates, which caused his popularity in the Inland Empire’s Latino culture to swell. RN Maria and Dr. Albert Arteaga partners in healthcare and family Celebrate 30 years of Making People Healthier in California. Dr. Arteaga has always believed that his key to business success was finding a way to get paid for their services, instead of telling patients they had to figure that out on their own before seeing him. For most of LaSalle’s history, that business model meant LaSalle employees educated patients about their health care insurance options. Most patients LaSalle saw over the years qualified for either Medi-Cal or Healthy Families. The latter, which like Medi-Cal was run by the state of California, offered low to moderate-income parents who didn’t qualify for Medi-Cal a subsidy for the health care of their children from birth to age 19. Things have changed in the last two years. In 2013, California got a head start on the Affordable Care Act; they created Covered California and merged Healthy Families and Medi-Cal together. In 2014, one of the key Covered California’s requirements is everyone must have health insurance or pay a penalty. This means, many patients applied and signed up for Covered California, Medi-Cal or other insurance first, and then choose or are assigned to LaSalle Medical Associates. Consequently, rather than informing new patients of their insurance options, LaSalle Medical Associates employees now more likely are helping the patients understand how their health insurance system works. Dr. Arteaga acknowledges the Covered California has brought changes some people will take a while to get accustomed to. One of these is a concept called managed care. “The structure of the Covered California means many people, both those who had some other type of insurance and those who were uninsured, are now in managed care for the first time,” he said. Managed care is called this because it requires a doctor, such as one of the physicians in LaSalle Medical Associates, to coordinate patients’ health care services. These primary care doctors have a general, family or pediatric practice, and will treat patients for many of their symptoms, but will refer the patients to specialists when more expertise is needed. Managed care has been around since the 1990s, Dr. Arteaga said, but it has become more popular. It’s usually more cost-efficient to have managed care, he explained, people choose to buy managed care for its lower premiums. Medi-Cal has used managed care for nearly two decades. Meanwhile, LaSalle Medical Associates, since the beginning, has accepted Medi-Cal when many doctors would not, and now has a reputation among those familiar with Medi-Cal for providing quality services, no matter how payment is provided. Even though there wasn’t “managed care,” as it now known when Dr. Arteaga started his practice, even back then he was in favor of patients developing close relationships with one family doctor. Dr. Arteaga sees the physician as an advocate for the patient, one who will make sure patients get the services they truly need. Sometimes, just as some patients will push for more health care than is necessary, some insurance companies will resist paying for what a doctor recommends, but that is not the intent of managed care. Besides managed care and its great expansion through the Affordable Care Act, another large change in the health care industry over the last three decades has been more careful monitoring of expenses by insurance companies. Now, it is better for a medical group like LaSalle Medical Associates to band with even more doctors, so they can take advantage of economies of scale, and provide health care more cost-efficiently. This is why LaSalle Medical Associates formed an Independent Practice Association (IPA) in 1995, and has grown it to the point it now serves more than 600 medical clinics serving more than 170,000 patients each year in nine California counties. LaSalle oversees administrative functions of all these medical clinics, although they are owned and manage their patients’ health care separately. Another move to make health care more efficient, in many ways, is one that LaSalle Medical Associates only recently transitioned to. It now is keeping track of patients’ charts with electronic medical records, ridding itself of the wall full of patients’ medical records that once were a hallmark of many medical clinics. One other significant change over the last 30 years has been that most patients are more involved in their health care now than they were in 1984. One thing Dr. Arteaga has learned during his three decades of medical practice is that change can be good. In fact, one thing he loves about being the CEO of LaSalle Medical Associates is that he gets to lead other health care professionals through the changes their industry faces. On the first day, owner Dr. Albert Arteaga and his wife Maria then employed as his nurse and still his chief assistant saw two patients at their clinic in Fontana. Today, LaSalle Medical Associates has grown to four clinics and 120 employees, and an Independent Practice Association (IPA) serving more than 1,900 doctors. In the end is true LaSalle Medical Associates has spent Three Decades Making People Healthier. 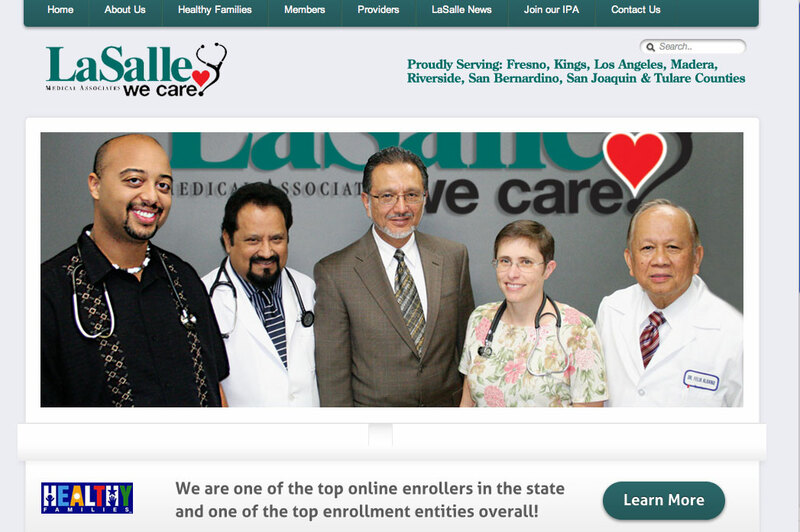 For more information about LaSalle Medical Associates, call (909) 890-0407 or go on line to LaSalleMedical.com. (Ontario, CA) Hispanic Lifestyle recently named LaSalle Medical Associates, Inc. as a leading Latino Owned Business that has survived and thrived during the economic downturn. “Hispanic Lifestyle is pleased to recognize LaSalle Medical Associates as a business that not only survived the economic downturn but thrived,” said Richard Sandoval, president of Hispanic Lifestyle. Since 2007, LaSalle has expanded its Independent Practice Association (IPA) of independently contracted doctors, hospitals and clinics, delivering high quality patient care to more than 170,000 residents of Fresno, Kings, Los Angeles, Madera, Riverside, San Bernardino, San Joaquin, Stanislaus and Tulare Counties. Rancho Paseo Medical Group, Alessandro Medical Group, Banning Medical Group, and San Bernardino Urological Associates. Hospital affiliations include: Rancho Springs Medical Center, Arrowhead Regional Medical Center, Community Hospital of San Bernardino, St. Bernadine Medical Center, Mountains Community Hospital, Redlands Community Hospital, Loma Linda University Medical Center, Corona Regional Medical Center, Riverside County Medical Center, and Parkview Community Hospital. LaSalle Medical Associates, Inc., owns four clinics employing more than 120 dedicated healthcare professionals, treating about 40,000 children, adults, and seniors in San Bernardino County. LaSalle’s patients are primarily served by Medi-Cal and the insurance companies participating in Covered California, which is a program offering a state subsidy to middle class families for the health care coverage required by the Affordable Care Act. LaSalle also accepts private insurance policies offered by IEHP, Molina, Blue Cross, Blue Shield, Care 1st, and Health Net and Medicare by Easy Choice Health Plan, Molina and Care1st Health Plans. Find a LaSalle clinic in Fontana at 17577 Arrow Blvd., in Hesperia at16455 Main St. and in San Bernardino at 1505 West 17th St. or 565 N. Mt. Vernon Ave.
Hispanic Lifestyle’s Business Expo and Conference luncheon on Wednesday, August 6, 2014 at the Ontario Airport Hotel in Ontario, California at 11:30 am. The conference runs from 8:30 a.m. to 2:00 p.m. The all day conference and expo features presentations by Latino/Latinas Executives of Influence, a panel discussion on business matchmaking. The conference will be captured for distribution for Southern California PBS television stations and the Hispanic Network website. “The awardees were compiled from audience nominations and business profiles that have been featured on Hispanic Lifestyle,” said Richard Sandoval, producer of Hispanic Lifestyle. For more information on LaSalle Medical Associates call (909) 890-0407. (San Bernardino, Calif.) – For many students, seeing the doctor for their annual physical is a requirement at the start of a new school year. While in the past, some families couldn’t afford school physicals because they lacked health insurance, The Affordable Care Act and California Covered in most cases allows health care providers to offer preventive care at no cost, even when patients have health insurance policies that usually require co-pays. School Physicals and Immunizations are generally FREE with California Care health insurance membership. Physicals for children typically include making sure they have reached adequate height and weight for their age. Doctors also make sure children are up-to-date on the immunizations needed for their age. Young children also are evaluated to make sure they can perform certain tasks. For instance a child entering kindergarten should be able to play well with other children, state his or her first and last name, color with crayons and dress him or herself. Kindergarteners who are not able to do these things may have developmental delays that will cause them to need extra help throughout their education, and may also have medical conditions that need close monitoring by a doctor. As with adults, physicals also are a time to check overall health, by checking blood pressure, hearing and vision. Doctors also may order blood tests to check for anemia, and a urinalysis to check for infections and diseases such as diabetes. Most K-12 students in San Bernardino County begin school in August, as do many colleges. Parents of any students needing a mandatory back-to-school physical to start school before Labor Day should schedule an appointment with their doctor immediately. Athletes, and anyone who starts school in September should not wait much longer. To make an appointment, or for more information about LaSalle Medical Associates, call the LaSalle clinics nearest you; Fontana 17577 Arrow Blvd. in phone (909) 823-4454, in Hesperia 16455 Main St. phone (760) 947-2161, and in San Bernardino 1505 West 17th St. phone (760) 947-2161 and 565 N. Mt. Vernon Ave. phone (909) 884-9091 . Children need immunizations (shots) to protect them from certain dangerous childhood diseases. Without immunizations, your child can get these diseases – some of which have no cure. When you get your children fully immunized, you are giving them the best protection against these diseases. Getting immunized also helps protect your community. Diseases spread more easily from person to person if people don’t have all their shots. “We are honored to have more Doctors to help serve the thousands of patients who have placed their trust in our network of primary physicians and healthcare professionals in California,” said Dr. Albert Arteaga founder and Chief Executive officer of LaSalle Medical Associates, Inc. Left to Right: Dr. Joseph V. Selvarj, Dr. Albert Arteaga, Dr. Cheryl Emoto, and Dr. Felix A. Albano. (Fresno, CA) LaSalle Medical Associates Inc. grows in the Central Valley announcing a new contract with Care 1st to serve as its Medicare healthcare provider in Fresno County. LaSalle Medical Associates, Inc. is an Independent Practice Association (IPA) of independently contracted doctors, hospitals and clinics, delivering high quality patient care to approximately 150,000 people in Fresno, Kings, San Joaquin, Stanislaus, Madera, Tulare, Los Angeles, Riverside, and San Bernardino Counties. “Care 1st has tapped in to LaSalle’s long standing service presence in the Central Valley to help them serve Medicare patients. LaSalle is already delivering a full range of Medi-Cal insurance products including and Medicare in a number of other counties in California,” said Carl Maier, executive vice president of LaSalle Medical Associates, Inc.
LaSalle Medical Associates is one of the largest independent minority owned healthcare companies in California. LaSalle also accepts Anthem Blue Cross, Molina, Care 1st, Health Net and Inland Empire Health Plan (IEHP) in 9 California counties. “Many people think of LaSalle as a medical provider for children’s services. They are very surprised to know we deliver services to children, adults, seniors and people with disabilities. Many of the people we serve today already have Medicare or will get Medicare shortly because of their disabilities,” said Maier. “I am honored to have more Doctors to help serve the thousands of patients who have placed their trust in our network of primary physicians and healthcare professionals in California,” said Dr. Albert Arteaga founder and Chief Executive officer of LaSalle Medical Associates, Inc.
LaSalle plans to continue to grow and serve low-income people and welcomes the new Affordable Health Care Act some times called Obama Care. “As a large provider of service to government sponsored health care programs we understand what the state’s implementation of the Affordable Health Care Act and expansion of Medi-Cal means here in California. A lot of uninsured people with a high demand for service are going to be coming to doctors, clinics and hospitals in 2014,” said Dr. Arteaga. “Our mission continues and LaSalle is preparing to welcome 1 million new low-income patients in the nine counties we serve. We are recruiting more health care professionals to increase our ability to provide more health care to more patients. Why? Everyone deserves high quality health care delivered with dignity and respect regardless of ethnicity or income,” said Dr. Arteaga. The Arteaga’s also built their practice on the belief that “everyone deserves high quality health care”. Everyone also deserves to be treated by their doctor with “dignity and respect regardless of ethnicity or income”. That philosophy has been successful. On the first day of his practice Dr. Albert Arteaga and Maria saw two patients at their clinic at 17577 Arrow Boulevard in Fontana. Now LaSalle Medical Associates cares for 160,000 patients across nine counties in California. Success came quickly as word spread of caring doctors that also accepted Medi-Cal and affordable cash payments. By 1992 the Fontana location grew and LaSalle had added clinics at 16455 Main Street in Hesperia, two in San Bernardino at 1505 West 17th Street, and 565 N. Mount Vernon Avenue. 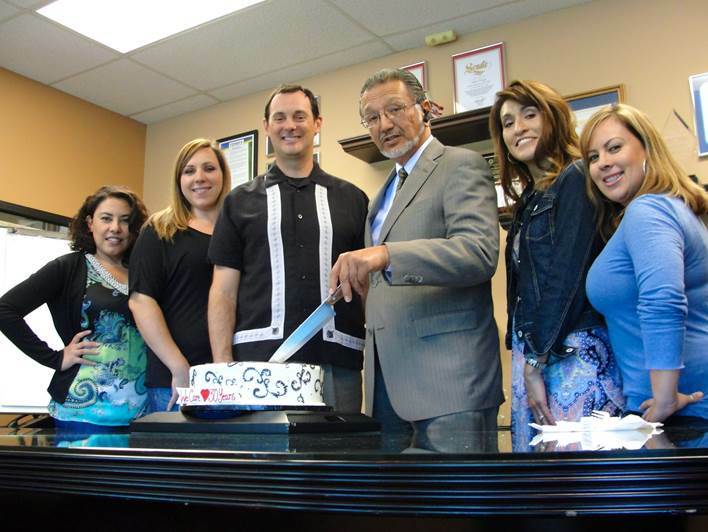 To run the growing business the Arteaga’s opened a corporate office in San Bernardino at 685 Carnegie Drive, Suite 230. The Arteaga’s started an Independent Practice Association or IPA in 1995 in response to changes in health care created by government and insurance companies. The insurance companies prefer to negotiate for health care services and compensation with groups of physicians rather than individual doctors. LaSalle Medical Associates accepted the challenge and has grown to a network of 1,900 independently contracted doctors, hospitals and clinics, delivering high quality patient care. Now LaSalle Medical Associates is one of the largest independent minority owned healthcare companies in California. LaSalle has a team of 120 healthcare professionals at LaSalle’s four clinics in San Bernardino County. Through its IPA 1,900 independently contracted doctors, hospitals and clinics, deliver high quality patient care in Riverside, San Bernardino, Los Angeles, Stanislaus, Fresno, Kings, Tulare, San Joaquin and Madera counties. In 29 years of business the Arteaga’s have seen good times and bad, recession and boom, and several business challenges. Through it all Dr. Arteaga has strived not only to be a great physician, but also a good businessman. “Treating patients with dignity and respect is not only the right thing to do, it is also a good business practice, it has built us a solid, loyal patient base,” said Dr. Arteaga. Those patents in turn recommended LaSalle Medical Associates to their friends and family. Some of who now have chosen LaSalle for their health care needs for three generations. The Arteaga’s have also focused on keeping expenses low and service quality high. And they have helped many patients who might otherwise struggle to pay for even basic medical care to find insurance that will pay the bill. Since Dr. Arteaga’s specialty is pediatrics, La Salle Medical Associates initially focused on serving children of the lower income and disabled. Dr. Arteaga quickly realized there were even greater community needs. Public and professional recognition has not escaped LaSalle Medical Associates and The Arteaga’s. In 2012 Dr. Albert Arteaga, became California’s first-ever CDC Childhood Immunization Champion and one of only 39 across the country receiving the prestigious honor. The California Medical Association awarded him the “Ethnic Physician’s Leadership Award,” recognizing his contributions to medical care in the Latino community. He also was named one of the top 15 Latino-owned businesses in the Inland Empire by Hispanic Lifestyle magazine. Dr. Arteaga was awarded the San Bernardino County Medical Society’s Merlin Hendrickson M.D. Award for his outstanding contribution to the community. Inland Empire Health Plan selected LaSalle’s clinics as Riverside and San Bernardino counties’ best healthcare provider, while the African American Health Initiative selected LaSalle as a “model provider” of Black healthcare in San Bernardino County. The San Bernardino Board of Supervisors has presented Dr. Arteaga a Resolution for his outstanding community efforts, and the Inland Empire Health Plan awarded LaSalle Medical Associates a Proclamation Award in appreciation of outstanding community work and for being the state’s number one enroller of the Healthy Families program, an insurance plan for children of low-to middle-income families. “As a large provider of service to Medi-Cal patients we understand what the state’s implementation of the Affordable Care Act and expansion of Medi-Cal means here in California. A lot of uninsured people with a high demand for service are going to be coming to doctors, clinics and hospitals in 2014. LaSalle is preparing to welcome those one million new low income patients in the nine counties we serve,” said Dr. Arteaga. He added, “We are recruiting more health care professionals to increase our ability to provide more health care to more patients at the rate Medi-Cal pays”. LaSalle has also created new partnerships to fund expansion and is contracting with more cost effective service providers with larger service areas for lab work, x-rays, imaging and supplies, and expanded their billing and payment capabilities. LaSalle Medical Associates, Inc. is preparing for the expected increase in Californian’s who will be eligible for low-cost healthcare under the Patient Protection and Affordable Care Act, says Dr. Albert Arteaga, president and chief executive officer of LaSalle Medical Associates, Inc. The law, which is often referred to as “Obama Care,” takes effect in 2014. “At LaSalle we know how important childhood immunizations are to parents, schools and children’s health. With most Inland Empire children starting school in only a few weeks, a delay could result in children missing school,” said Dr. Albert Arteaga, president of LaSalle Medical Associates, Inc.
(San Bernardino, Calif.) – August is the month many Inland Empire children head back to school. Many of them, especially in grades 7-12, need to make sure they have all the necessary back-to-school immunizations. At LaSalle Medical Associates children can get their vaccinations for free, often the same day. Dr. Arteaga urges parents to schedule appointments for their child’s back-to-school examinations as soon as possible with a letter to all parents served by their four clinics in Fontana, San Bernardino and Hesperia. The California Vaccines for Children program is a federally funded program. The state of California requires that all children in grades 7-12 be immunized against whooping cough, also known as pertussis. Before starting classes, children in these grades must show proof of having been immunized after their 10th birthday. This state law came after an epidemic of pertussis cases in 2010, affecting more than 9,000 people and causing 10 deaths, including two infants in San Bernardino County. Pertussis epidemics affected many states in 2012 and California rates appear to be higher than usual again in 2013. Vaccinating older children not only keeps them healthy, but also prevents the disease from spreading from adolescents to infants and preschoolers, who are at greater risk of serious complications. For additional information about LaSalle Medical Associates, call (909) 890-0407.